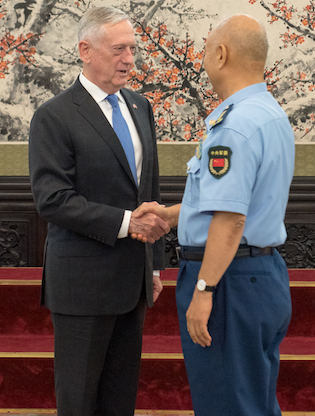 Xu greeted Mattis warmly at the ceremonial Chinese Defense Ministry building known as Bayi. The general showed little emotion and few clues to the growing tensions with the United States over Beijing's buildup of missiles on disputed islands in the South China Sea. "I believe the two of us can become good friends," a smiling Xu told Mattis at the start of what would become an hour-long meeting Thursday morning at the Bayi ceremonial defense ministry building in central Beijing. Mattis, for his part, made clear during his first visit to China that the meeting was about strategic interests, not friendships. The defense secretary delivered a clear and unambiguous message that differences between two of the world's most powerful militaries must be managed carefully or both nations could face a devastating conflict. The Americans fear China's military leaders—untested in combat—combined with an array of new high-technology weaponry is increasing the danger that a careless or reckless act by an overzealous Chinese regional commander will accidentally put the two nuclear-armed powers on the path to war. Potential triggers of a conflict could include a Chinese anti-ship missile attack against a U.S. warship sailing in a freedom of navigation operation in the South China Sea, or the downing of a U.S. surveillance plane over the sea from a long-range air defense missile. The Pentagon recently detected the deployment of both advanced anti-ship and air defense missiles on several of the Spratly islands near the Philippines. "Our relationship with China will be defined by our ability to competitively coexist," Mattis said during a stop in Japan a day after meeting Xu. "We look to cooperate where and when possible, and we will compete vigorously when we must." A day earlier, Mattis met China's supreme leader Xi who defiantly stated that China would never give up "one inch" of Chinese territory—in the South China Sea or elsewhere. The Mattis visit comes against the backdrop of a six-year political purge that ousted scores of PLA generals, including some of the most senior leaders. Analysts say the firings have left the Party-led military increasingly unstable. The combination of internal PLA dissatisfaction and increased military tensions regionally is a potentially volatile mix. Xu, in the meeting, squared off against Mattis over the islands and reefs in the South China Sea, insisting the maritime domain there is and will remain Chinese territory. The Spratlys, called the Nansha by the Chinese, are claimed by several other nations, including U.S. ally Philippines and Vietnam. China also has deployed military forces on the Paracels in the northern part of the sea. American defense officials said the meeting between Mattis and Xu began with Xu's recitation of official anti-U.S. talking points but then shifted to some off-script comments and a candid exchange of views. 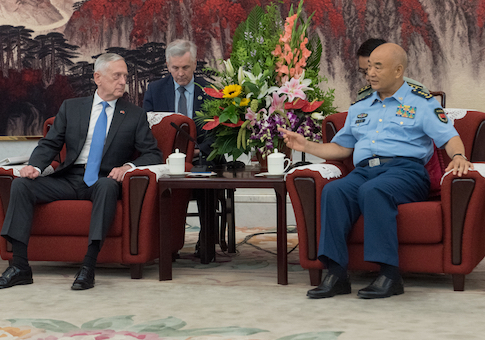 After listening to Xu's diatribe, Mattis, a blunt-spoken, war-hardened retired Marine Corps four-star general, informed Xu of American positions on China that emphasize U.S. military strength, commitment to supporting regional allies and freedom of flight and navigation, and engaging in strategic competition with China. Mattis made frequent references during his visit about the need for honest military dialogue as a means of avoiding miscalculation in the South China Sea and elsewhere in the region. Miscalculation has been used as a euphemism for a possible shooting incident or military collision that could set off a larger conflict. Domestically, Xu has been the driving force behind Xi Jinping's bid to consolidate power. Since becoming the general secretary in 2012, Xi has achieved more centralized power than any leader since founder Mao Zedong. Inside the secretive Communist system, Xu at the CMC has exercised near total control for the past seven years over the PLA. "A major concern is that they have arrested so many members of the military," said a specialist on the Chinese military. "So there are a lot of grievances and that has made the military unstable." Michael Pillsbury, a Chinese military affairs expert, agrees. "There are signs of increasing instability in the PLA and that presents new challenges not just for the United States, but for the world," he said. 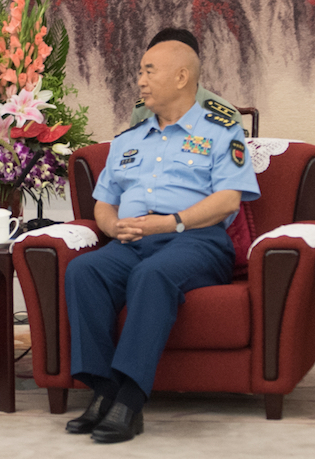 Xu is a four-star air force general who was named to the CMC vice chairman post in March 2013—three months after Xi's rise. Years before, the two worked together behind the scenes in preparing for the signature campaign of a nationwide anti-corruption drive used to consolidate power and remove potential rivals. As in the PLA, thousands of Party officials, including two senior leaders, Zhou Yongkang and Bo Xilai, were arrested. Both were close to the PLA and security bureaucracy. At least 60 generals and scores of lower-ranking PLA officers were arrested or ousted in the purge. The most sensitive arrests of senior military brass were handled by Xu who carefully prepared by first investigating who inside the upper ranks of the PLA would back the high-level arrests, and more importantly who might oppose them. "Xu is the person most trusted by Xi," said the expert on Chinese affairs. "All previous arrests of senior military people were recommended by him." The most alarming fall from grace during the purge was the ouster of Gen. Xu Caihou, a former CMC vice chairman and Party Politburo member. Xu Caihou was indicted for corruption but reportedly died of cancer before his case was resolved. A second former CMC vice chairman caught up in Xi's power consolidation campaign was Gen. Guo Boxiong, who was charged with taking more than $10 million in bribes. Guo confessed to facilitating military promotions, an indication his power within the PLA is vast and enduring despite his arrest. Overall as many as 13,000 military personnel have been disciplined under the purge and by 2017 80 percent of the PLA officers who attended the Communist Party Congress that October were first time attendees. Relations between Xu and Xi are said to be as close as those among family relatives. The two men worked together years before Xi assumed the top leadership posts in 2012. The military purge has produced divisions and resentment among many outside the military who are part of the wealthy ruling elite in China. Powerful clans exist in China that rely for their wealth and lifestyles on political connections with senior military officers. Thus the ouster of a senior military leader produces ripple effects of dissatisfaction and potential political opposition. Xi and Xu also are said to fear the potential political impact of growing divisions within the PLA over how to handle the current campaign of stepped up military and diplomatic pressure against Taiwan. They also are concerned about internal differences within the military over China's ongoing efforts to take control of the South China Sea through the disputed island campaign—one of the key talking points for Mattis during his visit. Magnifying those fears is another major worry for the Xi-Xu alliance: Growing political unrest among the 57 million former PLA soldiers. For the past year thousands of former PLA officers and troops have taken to the streets in mass protests demanding better retirement benefits and an end to the harsh treatment the protesters have received from the government. Days before Mattis' Air Force E-4B jumbo jet—used for nuclear command and control—touched down in Beijing on Tuesday, thousands of PLA veterans turned out for five days of public protests in eastern China. The ex-soldier voiced anger at inadequate retirement benefits and harsh treatment by security forces in response to the appeals. The large protests by PLA veterans were held in Zhenjiang, Jiangsu province and included public denunciations of violent attacks by Chinese security forces on protesting PLA veterans in other parts of China. On June 24, police in the province sent in hundreds of security forces to break up the demonstrations. Around 10,000 veterans are being held in detention centers in a bid by Chinese authorities to keep the unrest from spreading to areas of Beijing. Authorities feared the protests at the Bayi building would coincide with Mattis' visit and undermine China's plan for a smooth visit. One former PLA soldier told the South China Morning Post he was upset by the authorities' crackdown on protesters. "We had to make a compromise but we are still very angry," the retiree said. "Assaults on veterans [are] a public humiliation of China's military, but it's just the tip of the iceberg on the issue." Another former PLA soldier, Chen Wuliang, told the New York Times: "The problem is that there's too much corruption at the local level." News of the protests was blacked out in official print and online state media. Still, the soldiers' protests appear to be spreading throughout China as the protesters communicate through social media—despite censors' efforts to disrupt the communications. The PLA protesters in 2016 gathered outside the Bayi. The building is where Mattis met Wednesday with Wei Fenghe, China's defense minister and official host of the Mattis visit who is viewed as a relative figurehead in the PLA power structure compared to Xu. Both Xi and Xu have lavish offices on the upper floors of the Bayi building. But both leaders have the ultimate power perk in China: Dedicated elevators from their offices down to the underground high-speed rail system used exclusively by Chinese leaders to reach command centers miles away on the outskirts of Beijing. The secret high-speed rail system, built some 100 feet underground and hardened against nuclear attack, was recently expanded from two lines to four. The train is used to transport Chinese political and military leaders during crises to the secret underground PLA command center known as Western Hills. In China's communist system, advancement in rank comes with financial benefits, and financial corruption is endemic to China's military. Senior military leaders frequently use their vast power to amass fortunes for themselves, their families, and relatives. The money is often invested overseas in banks or real estate. During his military career, Xu amassed significant wealth for both himself and his family through carefully exploiting connections to Xi and Xi's family. Xu is also said to have had affairs with famous Chinese singers and actresses. One reason Xu has enthusiastically carried out the purge of fellow PLA officers is to protect his sub rosa activities from disclosure, in addition to eliminating rivals to Xi and himself. So far there are no signs leaders in the Chinese military have tried to push back against Xu, fearing retribution if they were to expose his corruption and the many charges leveled purged officers revealed as trumped up. The lack of any resistance from within the PLA has raised questions among some U.S. analysts about whether the PLA as a military force is capable of taking on an advanced military force like the United States without certain defeat. PLA leaders also are viewed as conflict averse over concerns any major conflict would cost the lives of their sole sons or daughters—an outgrowth of the decades long Chinese population control policies. Another deficiency of the PLA is that military leadership is dominated by the political class rather than professional military leaders. Since the purge began, the percentage of officers promoted to senior positions based on political connections rather than military merit has been reduced from 75 percent to around 50 percent. But if half the senior officers were promoted due of their Party connections, that does not bode well for the professionalism of the PLA and ability to wage modern war. Xu was able to rise to power by leveraging the PLA's vast intelligence system. Once divided into two PLA general staff departments, known as 2PLA and 3PLA, to discourage political spying on Chinese leaders, the PLA's formidable spy services were combined into one unit in late 2015. Xu as CMC vice chairman is now in charge of the powerful spy service and is said to be abusing the force to identify PLA generals and admirals who might be regarded as threats to Xi's rule. The consolidation of the military spy service also is designed to support Xi's announced policy in October 2017 that he will assume near total dictatorial power in China. The elimination of the 10-year limit means Xi has taken more power than any leader since the personality cult of Communist founder Mao Zedong. The PLA official newspaper under Xu's control obediently supported the power grab by Xi, calling the elimination of the two-term limit on leaders "very necessary." Like the many other new generals promoted by Xi as replacements for purged officers, Xu is a vehement critic of the United States. His animus toward America is both professional and personal. Like many of the senior military in China, Xu had many relatives in the United States and directed their removal because of his animosity. They were sent abroad instead to Australia, Hong Kong, and Britain. Anti-U.S. sentiment also was part of other meetings arranged for Mattis last week. As part of the anti-American sentiment, Xu has been the driving force behind the PLA's effort to develop a Chinese-Russian military entente. Xu was given wide authority from Xi to build relations with the Russian military and makes frequent visits for meetings with Russian Defense Minister Sergey Shoygu. The meetings are often held in a luxurious private residence in the Russian mountains owned by Shoygu. China's handling of the Mattis' visit also highlighted the priority Beijing places on its ties to Moscow's military. The defense secretary had been scheduled to make his first the trip to Beijing in March. But the visit was postponed when the purge within the PLA ensnared PLA Gen. Fang Fenghui, chief of the general staff. Fang and Mattis first met in person at the summit between President Trump and Xi in Mar-a-Lago, Florida. During an exchange, Fang asked Mattis what kind of enemy he preferred to fight. Mattis, who has an exquisite knowledge of military history, replied that he likes to fight militaries that train a lot but lack combat experience—a veiled reference to China's untested PLA. Hard training is no substitute for combat experience, the defense secretary told Fang, and even the best planning often falls apart early in a conflict under the chaos of war. The PLA has not been a conflict since a border conflict with Vietnam in the 1980s and corruption remains a serious problem. China told Mattis that delaying the planned March visit was designed to permit the new defense minister, Wei Fenghe, to settle into the position. But Asian intelligence sources said the real reason the March visit was delayed until late June was to allow Wei to first visit Russia in a bid to show China's desire for closer ties with the Russian military and not with the United States. Additionally, the Chinese sought to delay Mattis visit until the Chinese military's deployments of military forces on the disputed South China Sea island was completed. The Pentagon's most recent annual report on China's military power described Xu as "a public advocate for reform" perhaps as a result of his role in the anti-corruption purge and arrests. The report said Xu is deputy secretary of the CMC's reform leading group that is in charge of military reform. The Pentagon said Xu is the first career air force officer promoted to CMC vice chairman. Xu broke into the coveted power post of CMC membership while air force commander, and is credited with overseeing the air force's rapid modernization, and the PLA's expanded air force engagement with foreign militaries. "He may have crossed paths with Xi Jinping earlier in their careers when both men served in Fujian Province," the report said.